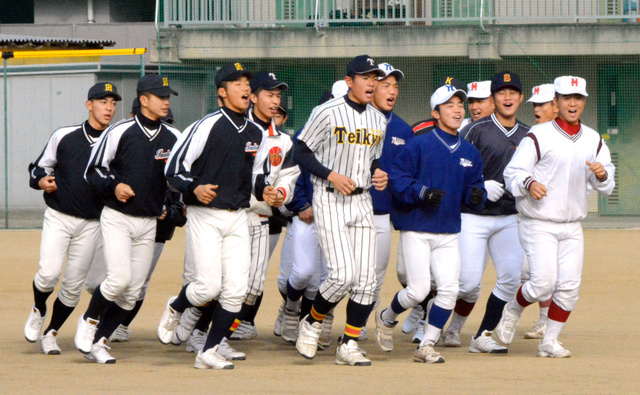 Ehime High School Baseball All Star Team assembled for a joint training at Matsuyama Commercial High School’s ground on December 20. They will travel to Taiwan to play friendly games against the 3 top teams of Taiwanese National Championship toward the end of December. The 20 players have been selected from the 8 top high schools at the prefectural championship this autumn, including Matsuyama Commercial H.S. and Nitta H.S. which were associated with legendary Mr. Hyotaro KONDO who managed KANO of Taiwan at the summer Koshien before the war. During the practice session on Sunday, the players aimed for close fielding work among infielders and outfielders.